Our law office gets a lot of calls involving pharmacy and anesthesia errors involving either the administration of improper medication or the failure to administer medication. It is not surprising, given that an astronomical 1.5 million people every year are victims of medication errors, according to a report by The Institute of Medicine of the National Academies. More people die annually from medication errors than from on the job injuries, according to the National Coordinating Council for Medication Error Reporting and Prevention. Fortunately, most of these injuries - particularly the pharmacy misfills - are benign, but pharmaceutical medication errors still account for almost a quarter of medical malpractice cases. Who is making these mistakes? There is a lot of blame to go around. Doctor, nurses, and pharmacists are all frequent defendants in these cases. Improper medication combinations – There are many prescription error cases where the drugs would be properly prescribed alone, but together cause serious or fatal injuries. These problems can be resolved by reading the package inserts and some hospitals and pharmacies have computer programs to assist in avoiding error. Yet there are still thousands of injuries from improper prescription combinations every year. Wrong medication - The patient is simply given the wrong medication by the pharmacy because of a pharmacy misfill. According to Jury Verdict Research, plaintiffs prevail at trial in 31% of these pharmacy misfill cases. Handwriting errors – Incredibly in 2008, our lawyers still commonly see the failure to administer the proper dosage from handwriting transcription errors. In the fortunate cases, handwriting error will only delay the time until patients receive their prescribed drug. At worst, a misread order can lead to serious injury or death. A lot of experts started making guesses as to the percentage of handwriting prescription errors after the heparin overdose given to Dennis Quaid's infant twins, but no definitive study has been done to demonstrate the number of prescription handwriting errors. Drug name mix-ups - Many prescription drugs have similar-sounding names. The physician and pharmacist need to be vigilant about ensuring they are not negligent in prescribing or dispensing the wrong medication. You would think this would be rare but name confusion is among the most common causes of prescription errors. A prime example is the confusion between the epilepsy drug Lamictal and antifungal drug Lamisil. About 10 years ago when scores of pharmacies were interchangeably filling prescriptions for Lamictal and Lamisil to the point where the FDA and Glaxo were required to send "Dear Doctor" letters advising of the confusion. Usually, there is no significant injury but with the wrong drug or the wrong patient, the injuries can be catastrophic or fatal. With the Lamictal/Lamisil confusion, the possible consequences of this mix-up were severe most for epileptic patients receiving Lamisil were not be able to control seizures which is obviously a big deal. Patients receiving Lamictal by mistake were at risk for less serious side effects such as blood pressure problems, rashes, and other troubling but not severe side effects. Adverse effects of medication - Many prescription drugs have side effects that have serious and fatal consequences. Sometimes these injuries are the regrettable side effects of the medication. Others are cases where the doctor knew or should have known that the risks of the drug outweigh the benefits. Often, doctors are given a huge heads-up of the possible risk with a black box warning. The central issue in these medical malpractice cases is whether the doctor was reasonable in prescribing the medication in light of the patient's medical history, physical condition, and all relevant diagnostic imaging or laboratory data. Another big issue in these cases is informed consent. Did the physician apprise the patient of the risks? Allergic reaction to medication – A subset of adverse effects, allergic reactions are usually difficult to detect. But if the prescribing doctor knows or has reason to know of the allergic reaction, often because the allergy is documented, it is a medical mistake that is medical malpractice. The first thing to keep in mind in these case The improper medication cases in this country that go to trial often tough cases either or negligence or causation. The best cases for the plaintiffs are improper dosage cases in which, according to Jury Verdict Research, the injury victim prevails 40% of the time at trial. The most difficult cases for plaintiff’s medication error lawyers to prevail are inappropriate medication cases; plaintiffs prevail in 23% of these cases. With respect to verdicts, the median verdict in medication error cases is $250,000. But this underscores that a lot of prescription error lawyers are willing to take smaller cases (our law firm only handles serious injury and death cases). A much different way to look at these numbers is that 60% of medication error cases result in a jury verdict over $1,000,000. Get more medication error statistics here. 2018, Pennsylvania: $1,000,000 Settlement. This wrongful death and survival action was the result of the death of a woman after she suffered respiratory distress after an emergency C-section of her twins. The woman had preeclampsia and pulmonary edema and was given two drugs that increase the risk of respiratory complications issues. 2018 Wisconsin: $325,000 Settlement. A man was allegedly prescribed 5 mg of methadone and the pharmacy 10 mg tablets. The pharmacy's defense was that the overdose did not cause his death. Its lawyers argued that the man would have died anyway as a result of a multiple medication overdose. This was likely a viable defense or the settlement would not have been this low. 2016, New York: $287,500 Settlement. During birth, an infant male suffers permanent neurological and physical injuries, global developmental delays, brain damage, and the inability to live independently, allegedly as a result of medical care provided to him and his mother. The mother claims that the hospital staff was negligent in the improper use of Oxytocin (a drug normally used to induce labor), contraindicated vaginal delivery, and improper use of tools during delivery. The parties settle for $287,500. 2015, California: $700,000 Settlement. A 28-year-old adult male is being treated for Lyme disease with two medications, Malarone and Larium, which are known to cause psychotic events in some patients. He subsequently suffers a neuropsychiatric adverse event with delusions, threatens and terrorizes his girlfriend for hours, until his arrest and commitment to a mental facility. He suffers PTSD as a result. He brings a claim against the doctor, alleging that he negligently prescribed the drugs with the known psychological side effects to a patient such as the plaintiff who had documented mood swings and depression. He further claims the doctor did not advise him of the risks and failed to monitor him. The parties settle for $700,000. 2015, Oregon: $12,195,500 Verdict: A 51-year old male is having an aortic valve replacement surgery at the hospital when the surgeon orders 150 mg of Amiodarone. 150 mg of this drug is the normal dose, however, the anesthesiologist administers 2,700 mg to the patient. This results in an anoxic brain injury from an overdose, leaving the man no longer able to work or walk on his own, requiring 24/7 care. He claims that the hospital was negligent for stocking multi-dose vials in an operating room, as it makes it more likely a medication error will occur. He also claims that the doctor administering the overdose was negligent and caused the heart to develop irregular rhythms, along with a loss of blood and oxygen to the brain. A jury awards him $12,195,500. 2015, Louisiana, $1,262,409 Verdict. A 49-year old male has a prescription for Tambocor (treats irregular heartbeat) filled, but is actually given Nortriptyline (an anti-depressant believed to cause atrial arrhythmia). He takes the medication for four months before discovering the error and begins to experience worsening of his irregular heartbeat condition. He suffers permanent damage to his heart, fatigue, depression, and neurological damage. He brings a claim against the pharmacist, claiming he was negligent in failing to properly inspect the medication prior to dispensing it and failing to ensure that the correct medications were placed in appropriate containers. He also alleges that the pharmacist should have realized he mistakenly filled the prescription for Tambocor with Nortriptyline on the day it happened, but he did not correct the mistake. He admits liability for the misfiled prescription, but disputes the nature of the damages, and claims that the condition worsened due to the progression of the disease rather than the medication error. A jury awards the man $1,262,409. 2014, Massachusetts: $1,500,000 Settlement. After giving birth to her second child, a woman with a history of congestive heart failure has high blood pressure. The obstetrician administers Labetalol, although this drug is not supposed to be given to patients with a history of congestive heart failure. After the drug is administered, the woman dies. Her estate brings a claim, alleging negligence in administering a drug that was clearly contraindicated. That claim is not settled, and she then brings suit against the insurance company, claiming they failed to properly investigate and settle. The defendants dispute liability and damages, and one month prior to trial, the case settles for $1,500,000 on the insurer’s actions. 2014, California: $375,000 Settlement. Plaintiff is having surgery at the hospital. It goes well, and she is transferred to the ICU and then to a private room as she appears fine. Three hours later, she is found unresponsive when the hospital staff comes to draw her blood. They try to resuscitate her, but they are unsuccessful, and she dies five days later. Her estate brings a claim alleging that she was overmedicated and that her alarms were not working which would have alerted the hospital staff earlier. The parties settle for $375,000. 2014, Pennsylvania: $450,000 Settlement. A 39-year-old man, a Chief of Detectives, is on anti-anxiety medication to treat work-related anxiety, prescribed by his family physician. While in the police station one day, he fatally shoots himself. His wife brings a claim, alleging the doctor negligently prescribed very high doses of the medication (Xanax), failed to establish a diagnosis consistent with the criteria for the drug Xanax, and prescribed reckless dosages of the drug to a patient known to have suicidal thoughts. The doctor also allegedly fails to consider the effects of prescribing Xanax while the man is on Ambien, which can cause addictive central nervous system effects. The doctor denies liability but agrees to settle for $450,000. 2013, Wisconsin: $12,000 Settlement. A 3-year old child is administered Valium instead of Decadron (to treat croup) at the Children’s Hospital of Wisconsin. He falls and suffers a head injury resulting in a concussion, and brings a claim alleging the pharmacy drew up the wrong medication. After the fall, the hospital admits him overnight for observation and treatment for a medication error. The parties settle for $12,000. 2013, Virginia: $240,000 Verdict. A 5-year-old is diagnosed with ADHD and prescribed clonidine. The pill can be compounded into a liquid for children’s ease in taking the medicine. Plaintiff’s mother obtained the prescription from the pharmacy and gave her daughter the prescribed dose. Within a half hour, the child lost consciousness and had a seizure. She fully recovered after an 11-day hospital stay. An analysis of the medication revealed that it contained more than 10 times the concentration of the active drug. A suit was filed against the pharmacy for the compound error resulting in an overdose. Plaintiff was awarded $240,000. 2012, Massachusetts: $100,000 Verdict. A 56-year-old woman with a long history of mental illness presents to her physician for treatment of anxiety and depression. She is prescribed 800 mg of Seroquel and 400 mg of Lamictal. Several months later, a nurse mistakenly notes on the woman’s chart that she is taking 800 mg of each, resulting in an over-prescription of the Lamictal. The error is discovered after months of her repeated complaints of dizziness, forgetfulness, and increased anxiety. She files suit alleging that the dosage error resulted in months of being overmedicated. Damages were the main issue in this case as the Plaintiff was unemployed and incurred no additional medical expenses as a result of the error. Plaintiff is awarded $100,000. 2010, Virginia: $125,000 Verdict. Plaintiff files suit against his local supermarket pharmacy for negligently providing him with the wrong medication. After months of deteriorating health, despite taking a prescribed thyroid replacement hormone medication, Plaintiff is hospitalized for three days. It is discovered that he is taking the wrong medication. His hospital stay is followed by months of medication to stabilize his thyroid condition. The Defendant maintains that the prescription was properly filled, but that the Plaintiff was not taking it as directed. Defendant further claimed that Plaintiff was contributorily negligent for failing to obtain the correct prescription when he noticed the pills he was given were a different color than prior prescriptions. Plaintiff claims $14,021 in past medical expenses. Plaintiff is awarded $125,000. 2006, Ohio: $200,000 Verdict. Plaintiff, a 30-year-old man, files suit after a pharmacy incorrectly fills a pain medicine prescription, causing the man to overdose. After receiving a prescription for 10mg pills, Plaintiff’s prescription is incorrectly filled with 100mg pills, to be taken on an as-needed basis. Plaintiff claimed he did not realize the wrong strength had been given to him as he had never taken the medicine before. Defendant pharmacy did not dispute the medication was not properly filled but claimed that the Plaintiff took more than what he was prescribed. A urinalysis at the ER indicated the presence of other, non-prescribed medication. The jury awarded $200,000 that was reduced to $120,000 due to 40% comparative negligence on the Plaintiff’s behalf. 2003, Maryland: $2,000,000 Settlement. A 32-year-old man dies as the result of narcotic intoxication. After being fitted for a prosthetic leg, the man is taken to the recovery room where he receives morphine and two doses of Demerol. He is then started on a PCA pump to administer morphine at scheduled intervals. After receiving multiple doses of morphine over a period of time, he is orally given OxyContin without first being assessed by a physician. His blood pressure steadily decreases over the next several hours until he is unable to void urine and requires catheterization. Within a few hours, he is found without a pulse. An autopsy reveals that he died as a result of narcotic intoxication. A suit is filed in Baltimore City on behalf of the man’s estate, alleging that the Defendants failed to evaluate and appropriately monitor decedent’s vital signs. Defendants agreed to a settlement in the amount of $2,000,000. 2000, Michigan: $340,000 Verdict. Plaintiff, a once very active 82-year-old woman, becomes dizzy and falls, striking her head. Eight days later she is diagnosed with a brain injury as the result of the fall. It is discovered that she had been on the wrong medication for 92 days as a result of her pharmacy dispensing the wrong medication. While Defendants admit to dispensing the wrong medication, they deny the proximate causation between the error and the subsequent fall and injury. Plaintiff’s experts testify as to the direct relationship between the error and the fall. A jury awards $340,000 in damages based on the woman’s very active lifestyle prior to the injury. You are probably wondering where are the Maryland verdicts are. For whatever reason, these cases do not seem to go to verdict in Maryland, at least not in recent years. Keep in mind that while these verdicts are great tools for understanding the value of these cases, they are just one tool that used alone is relatively meaningless. There are too many variables that go into a jury's thinking on these claims and these short summaries - that picked over a lot of defense verdicts - cannot provide. Below are examples of recently filed medication error malpractice lawsuits filed in Maryland with the story behind the claim. 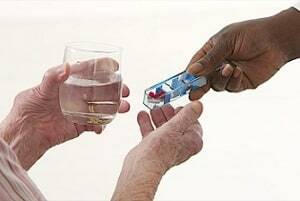 Nursing homes are a common venue for medication errors. This is a 2018 nursing home wrongful death medication error case in Baltimore County against FutureCare nursing home after a woman died as the result of medications the doctors knew placed her at high risk for hypoglycemia. This is a 2016 lawsuit against a nursing home in Cumberland after a woman died getting medicine prescribed for another patient. If you have a prescription error case, call one of medication error lawyers at 800-553-8082 or click here for a free Internet consultation.